Moog Music Forum • View topic - Just got a Minimoog Voyager! 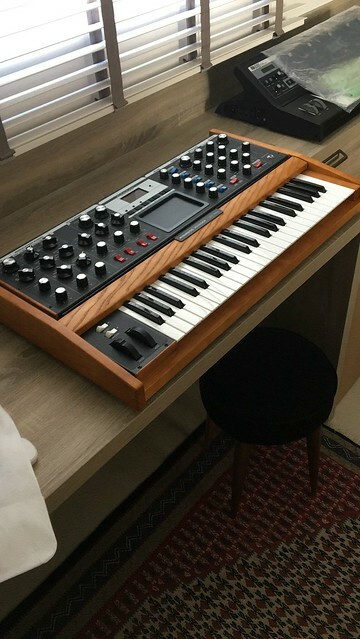 Just got a Minimoog Voyager! Re: Just got a Minimoog Voyager! Hey guys, I’m kind of sad now..... I’ve just perceived some kind of oscillator leakage on the left channel with the filter totally closed. I don’t know if this is a miscalibration thing or really a problem, but either way, I’d have to open my Minimoog to adjust something or send the boards to Moog Music. I’ll search more information on this forum about it, hoping for the best. Already contacted Moog Music, I’ll wait for a response tomorrow... I know I shouldn’t, but I’m really worried. Sending this from Brazil will be tough. Yes, the small oscillator leak continues, but I’m not actually really worried about it, as it seems simple to solve with some calibration on a VCA trimmer (according to Adam and also a friend of mine that works with electronics and builds his own synths as a hobby). I’m currently waiting for Moog to share with me which trimmer controls this VCA I need to adjust. Wanted to share with you a simple video that I did, tweaking some sounds on the fly, trying to show what the Voyager can do. It’s a long video, but I actually liked the result, even though it’s not exactly a musical video. I didn’t find any video like this one when I was lusting pretty hard for the Voyager, so I thought that maybe it would be nice to make one myself. Nice video, thank you fore sharing! The Voyager sounds great, looks great, is great and I love it! Adjust trimmer RP8 (analog board). Analog Prophet wrote: Nice video, thank you fore sharing! The Voyager sounds great, looks great, is great and I love it! Thanks. I couldn’t agree more... what an incredible instrument! Markyboard wrote: Adjust trimmer RP8 (analog board). It seems that this trimmer is the overall output adjustment, isn’t it? I received the calibration manual but didn’t want to open the thing before being 100% sure of what I need to adjust, so I can do it only once. The question is: isn’t there any other trimmer related to VCA stuff that isn’t documented in the calibration manual? I wonder simply because the leak is single sided (left output), and not on both. There are no other VCA trimmers. I suspect the filters are slightly different with tolerances and such. This would explain why you only hear the bleed through one side.I assume your sound is in dual low-pass mode. Markyboard wrote: There are no other VCA trimmers. I suspect the filters are slightly different with tolerances and such. This would explain why you only hear the bleed through one side.I assume your sound is in dual low-pass mode. Thanks a lot! That's good news for me then... I'm waiting for my multimeter to arrive, then I'll get it done with (the opening and adjusting thing). I'm not in exactly in a hurry - it's just a detail. It just sings so nicely that I overcame this annoyance quite quickly. IgorCristo that was a really good vid, thx for posting! ummagumma wrote: IgorCristo that was a really good vid, thx for posting! I’m back to share another video... quite simple and small this time. Great video again. Nice to start with one oscillator and double it up with a second slight detuned oscillator the second time of the theme. It’s my taste, I love playing the Voyager just through a long verb and get lost. Thanks for sharing! Analog Prophet wrote: Great video again. Nice to start with one oscillator and double it up with a second slight detuned oscillator the second time of the theme. It’s my taste, I love playing the Voyager just through a long verb and get lost. Thanks for sharing! Thanks once again! Yes, on the second time around I add not only the second, but also the third oscillator to the mix, and it sounds gorgeous. I’m totally in love with this instrument. It’s just beautiful, really clean sound. Cheers!